Our mono and multi-layer blown film technology is used in applications among numerous industries, supplying films for packaging, construction, shrink, stretch, and collation. UPE manufactures mono-layer dies from 1” diameter to 120” diameter, mounted on an oscillating block as standard. Rotating and fixed blocks are also available. Our bottom-fed spiral mandrel single-layer dies produce quality films from a wide range of polymers. 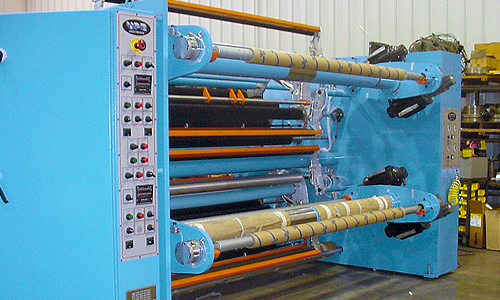 UPE manufactures co-extrusion multi-layer dies from 2” diameter to 120” diameter die opening. The die can be built in the form of nested spiral manifold up to five (5) layers. We offer oscillating co-extrusion dies from two (2) layers to five (5) layers and die sizes from 2” diameter to 60” diameter. UPE can provide solutions for design, manufacturing, controls and integration to help you refurbish your existing equipment. We repair and rebuild all makes of single-layer and co-extrusion multi-layer blown film dies, die blocks and air rings. We repair and rebuild all makes and sizes of single wall or multi-wall, corrugated plastic pipe dies, carriages, cooling mandrels and mold blocks. We can also repair and refurbish most brands, sizes and models of film winders.